Closed: 12:00 p.m. - 1:00 p.m. The modern history of the Sonoma Valley is summarized in a greatly abbreviated form by the grave markers found in the City's cemeteries. These old, beautiful remnants of past lives and their influence on the current character of the City, and even the entire Northern California region, should not be forgotten. 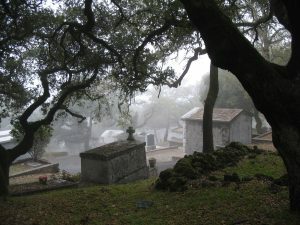 The City of Sonoma owns, maintains, and operates three cemetery properties (Mountain Cemetery, Valley Cemetery, and Veterans' Cemetery) that actively provide the service of final disposition of its citizens' remains. Learn more in our cemeteries brochure and by viewing the frequently asked questions at the bottom of this page. Many of the City's civic, economic and cultural leaders are buried in the cemeteries, most notably, General Vallejo and his wife, Francisco Carrillo Vallejo. A brief tour of the cemeteries will show many well-known winemaking, farming, and long-time valley resident families, such as Sebastiani, McTaggart, Riboni, Ruggles, Dolcini, Bundschu, and Mulas. There are many beautiful family mausoleum buildings memorializing their families' prominence in the community. Captain H.E. Boyes, George Fetters, Franklin Sears and two Donner Party survivors are interned in Mountain Cemetery. The Sons of the American Revolutionary War claim that a veteran from that era, Captain William Smith of Flowerdew Hundred, Virginia, is buried in an unmarked grave at Mountain Cemetery, making the cemetery one of the oldest continually operated cemeteries in the western United States, and perhaps also one of the most beautiful. Do any of your cemeteries offer full in-ground plots? Unfortunately, Veterans Memorial Park, Mountain Cemetery and Valley Cemetery no longer have any available full burial ground plots. Is there any space available at Mountain or Valley Cemetery for urns to be placed in the ground? Yes, both Mountain and Valley Cemeteries offer in-ground cremain placement. Does the City of Sonoma have any mausoleums at their cemeteries? Yes, we have a mausoleum at Mountain Cemetery in the Mountain Annex location. We have available space for niches and full burial crypts in Mausoleum # 11. How can I find out if my ancestor is buried at Mountain Cemetery? The City’s records do not go back beyond 1970. We do not have any historical records on grave sites other than our walking tour map of well-known winemakers, farming and long-time valley residents. Included on this walking tour is the location of General Vallejo’s grave site. Ancestors.com and FindaGrave.com is very helpful as well as walking through the cemetery. Many people have found their relatives by locating family grave markers that they had no idea existed. How can our family put a veteran’s name on the star at the Veterans Memorial Park? The contact for the engraving for the star is not through the City of Sonoma. The contact is through VeteransRememberedFlag.com. All information can be found on this web site. Why is the Veterans Memorial Park so expensive? The National Veterans Cemeteries do not charge for burial. The City of Sonoma owns, maintains and operates the Veterans Memorial Park. It is not a National Veterans Cemetery. Can anyone be buried at the Veterans Memorial Park? The Veterans Memorial Park is for veterans that has served their country. They must have discharge papers in order to be buried in that cemetery. The spouse may be buried with the Veteran however no other family members (eg., sisters, brothers, daughters, sons, etc.,) may not be interred. How do I pay for my cemetery plot/niche? We take checks, cashier’s checks, or cash. Sorry, we don’t accept credit cards. The checks should be made payable to the City of Sonoma. For payment plans, please contact Rita Gipson at (707) 933-2218 or email her at rgipson@sonomacity.org.